A research team led by Rebecca Shultz , Biomechanist, and Dr. Jason Dragoo , Stanford Sports Medicine Team Physician and Orthopedic Surgeon, had the article “Differences in ACL Biomechanical Risk Factors Between Field Hockey and Lacrosse Female Athletes” published in Knee Surgery, Sports Traumatology, Arthroscopy. 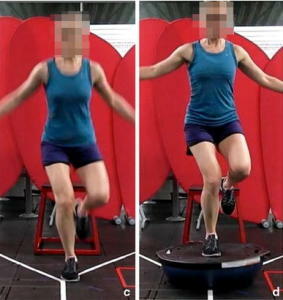 The research team examined 31 Division I female athletes, and found during the single leg drop and single leg drop onto a BOSU ball, peak knee flexion angles were greater in field hockey compared with lacrosse. During cutting, field hockey players were more flexed at the trunk and had greater trunk sway, compared with the lacrosse players. This may influence ACL injury prevention programs in the future, as it may indicate that the programs should be sport specific to address individual risk factors.